Reserving hexameter poetry and Comedy for consideration hereafter, let us proceed now to the discussion of Tragedy; before doing so, however, we must gather up the definition resulting from what has been said. A tragedy, then, is the imitation of an action that is serious and also, as having magnitude, complete in itself; in language with pleasurable accessories, each kind brought in separately in the parts of the work; in a dramatic, not in a narrative form; with incidents arousing pity and fear, wherewith to accomplish its catharsis of such emotions. Here by ’language with pleasurable accessories’ I mean that with rhythm and harmony or song superadded; and by ’the kinds separately’ I mean that some portions are worked out with verse only, and others in turn with song. I. As they act the stories, it follows that in the first place the Spectacle (or stage-appearance of the actors) must be some part of the whole; and in the second Melody and Diction, these two being the means of their imitation. Here by ’Diction’ I mean merely this, the composition of the verses; and by ’Melody’, what is too completely understood to require explanation. But further: the subject represented also is an action; and the action involves agents, who must necessarily have their distinctive qualities both of character and thought, since it is from these that we ascribe certain qualities to their actions. There are in the natural order of things, therefore, two causes, Character and Thought, of their actions, and consequently of their success or failure in their lives. Now the action (that which was done) is represented in the play by the Fable or Plot. The Fable, in our present sense of the term, is simply this, the combination of the incidents, or things done in the story; whereas Character is what makes us ascribe certain moral qualities to the agents; and Thought is shown in all they say when proving a particular point or, it may be, enunciating a general truth. There are six parts consequently of every tragedy, as a whole, that is, of such or such quality, viz. a Fable or Plot, Characters, Diction, Thought, Spectacle and Melody; two of them arising from the means, one from the manner, and three from the objects of the dramatic imitation; and there is nothing else besides these six. Of these, its formative elements, then, not a few of the dramatists have made due use, as every play, one may say, admits of Spectacle, Character, Fable, Diction, Melody, and Thought. Tragedy i.e.sentially an imitation not of persons but of action and life, of happiness and misery. All human happiness or misery takes the form of action; the end for which we live is a certain kind of activity, not a quality. Characte.g.ves us qualities, but it is in our actionswhat we dothat we are happy or the reverse. In a play accordingly they do not act in order to portray the Characters; they include the Characters for the sake of the action. So that it is the action in it, i.e. its Fable or Plot, that is the end and purpose of the tragedy; and the end i.e.erywhere the chief thing. Besides this, a tragedy is impossible without action, but there may be one without Character. The tragedies of most of the moderns are characterlessa defect common among poets of all kinds, and with its counterpart in painting in Zeuxis as compared with Polygnotus; for whereas the latter is strong in character, the work of Zeuxis is devoid of it. And again: one may string together a series of characteristic speeches of the utmost finish as regards Diction and Thought, and yet fail to produce the true tragi.e.fect; but one will have much better success with a tragedy which, however inferior in these respects, has a Plot, a combination of incidents, in it. And again: the most powerful elements of attraction in Tragedy, the Peripeties and Discoveries, are parts of the Plot. A further proof is in the fact that beginners succeed earlier with the Diction and Characters than with the construction of a story; and the same may be said of nearly all the early dramatists. We maintain, therefore, that the first essential, the life and soul, so to speak, of Tragedy is the Plot; and that the Characters come secondcompare the parallel in painting, where the most beautiful colours laid on without order will not give one the same pleasure as a simple black-and-white sketch of a portrait. We maintain that Tragedy is primarily an imitation of action, and that it is mainly for the sake of the action that it imitates the personal agents. Third comes the element of Thought, i.e. the power of saying whatever can be said, or what is appropriate to the occasion. This is what, in the speeches in Tragedy, falls under the arts of Politics and Rhetoric; for the older poets make their personages discourse like statesmen, and the moderns like rhetoricians. One must not confuse it with Character. Character in a play is that which reveals the moral purpose of the agents, i.e. the sort of thing they seek or avoid, where that is not obvioushence there is no room for Character in a speech on a purely indifferent subject. Thought, on the other hand, is shown in all they say when proving or disproving some particular point, or enunciating some universal proposition. Fourth among the literary elements is the Diction of the personages, i.e. as before explained, the expression of their thoughts in words, which is practically the same thing with verse as with prose. As for the two remaining parts, the Melody is the greatest of the pleasurable accessories of Tragedy. The Spectacle, though an attraction, is the least artistic of all the parts, and has least to do with the art of poetry. The tragi.e.fect is quite possible without a public performance and actors; and besides, the getting-up of the Spectacle is more a matter for the costumier than the poet. 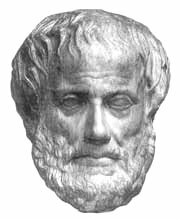 This complete text of the The Poetics book by Aristotle, translated by Ingram Bywater, with a preface by Gilbert Murray, is in the public domain. This page has been created by Philipp Lenssen. Page last updated on April 2004. Complete book.